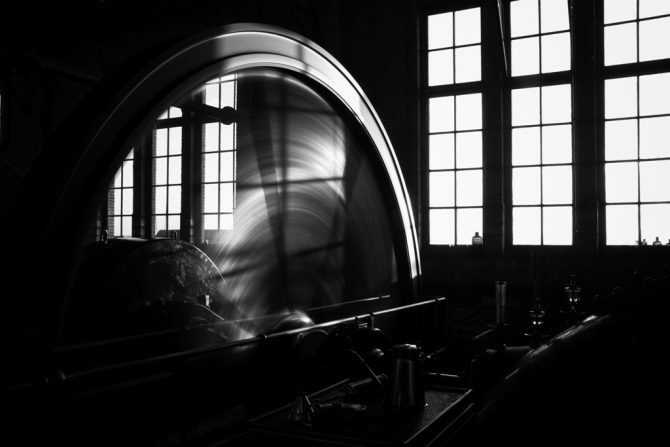 Movement of flywheel in the largest steam-driven pumping station in the world: the Woudagemaal in Lemmer, the Netherlands, on the 1st of February 2013. It is impressive to see it in use. It is also impressive that this pumping station is still part of the water management system in the province Friesland and needs to be activated 10-15 times a year to keep the groundwater level at a good level (not too high, to ‘keep dry feet’). When in use, the steam-driven pumping station pumps over four million litres of water per minute from the Frisian ‘boezem’ (drainage pool) into the IJsselmeer. The Woudagemaal is on the UNESCO World Heritage List. Original post: 2 february 2013. Update with picture I made in the visitors centre that day: June 2015.